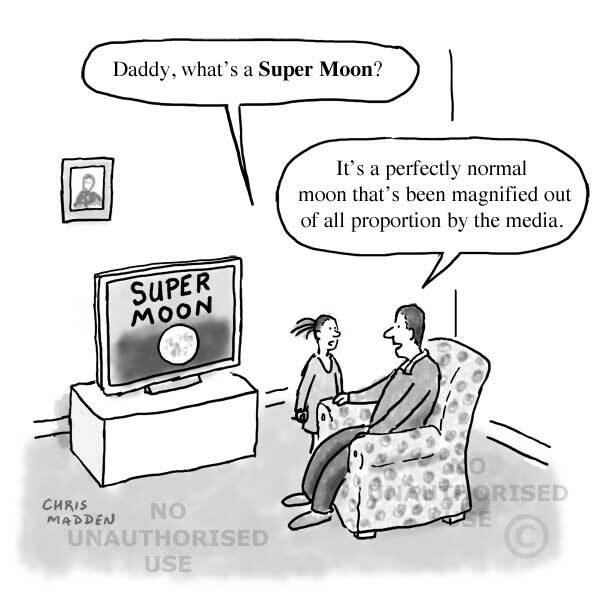 Super moons were unheard of in the media until the last few years. Now every time the moon gets close to the earth in its orbit the press is full of it, with misleading photographs to make the moon look huge and spectacular (taken with telephoto lenses so that the moon looks large compared to objects such as people or buildings in the distance). 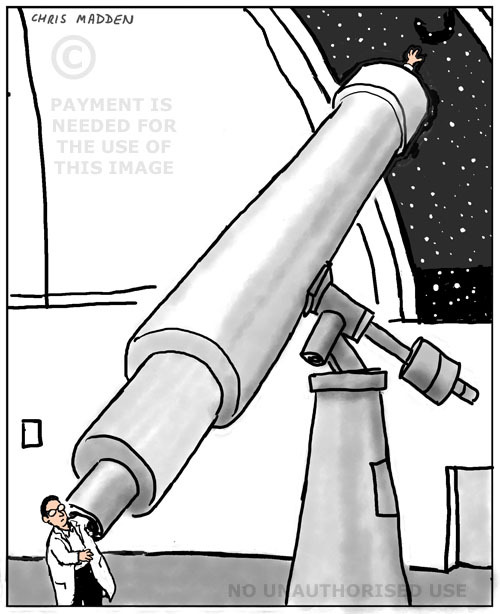 A cartoon showing an astronomer reaching for the stars by reaching up inside an astronomical telescope. The astronomer’s hand is appearing out or the top of the telescope as though it is grasping for the stars. 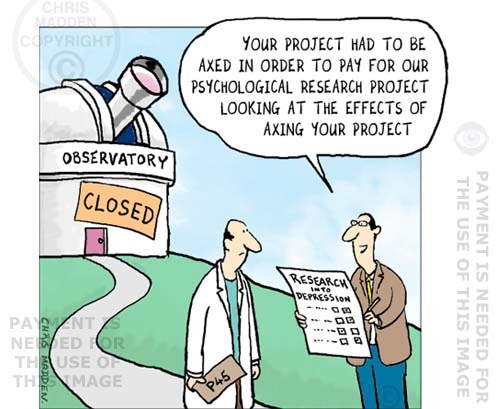 An illustration concerning people’s urge to discover more about the universe through scientific exploration. A cartoon about scientific exploration, inquiring minds, curiosity, curiousity, reaching for the stats. 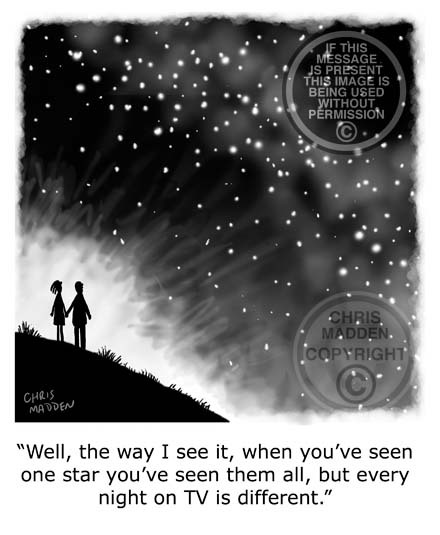 A cartoon about the question: does the vast immensity of the universe mean that people are insignificant? An Apollo astronaut and a woman with a coffee trolley. The scene is a mock up of the lunar surface for an Apollo training exercise. Or is it? A cartoon about the transience of fame and celebrity, and the judgement of achievement. Most people know that Neil Armstrong was the first man to walk on the moon, and that Buzz Aldrin was the second. But no-one remembers who the third man on the moon was. The fourth man to walk on the moon was Alan Bean. Pete Conrad and Alan Bean were the lunar landing crew of Apollo 12, the second moon mission to land on the moon. Apollo lunar excursion module (lem) design cartoon. Cartoon showing an Apollo moon mission lem (lunar excursion module) in a museum. It’s a cartoon that comments on the fact that the Apollo moon missions took place in a time that is now history, although when they happened they felt like (and were) a symbol of the modern age – the space age. In Britain the prime minister used the expression ‘the white heat of technology’ to describe the progress of the era. It also comments on the fact that in the early 21st century we live in a design obsessed age (look at Apple products), where design is often appreciated before usefulness. I first drew this cartoon in 1999, when the 1960s weren’t so far in the past! This is a redrawn version prompted by the death of Neil Armstrong. 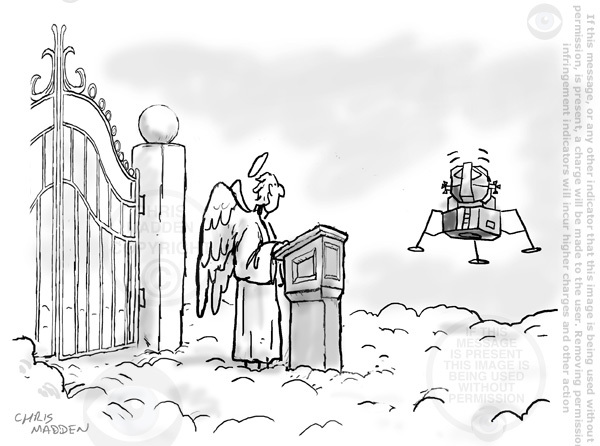 To mark the death of Neil Armstrong, the first man to walk on the moon, this cartoon shows the Apollo landing craft coming in to land at the pearly gates of heaven. Apollo 11 reached the moon in summer 1969. Neil Armstrong was the first man to walk on the moon, followed closely by Buzz Aldrin. Who remembers who the third man to walk on the moon was? (Charles P. (Pete) Conrad, who died in 1999, aged 69, following a motorcycle accident. I don’t recall hearing about it in the news. Such is the measure of achievement). Just for the pedantic amongst you, I know that the lunar landing craft (or lem – lunar excursion module) would have had Buzz Aldrin in it in real life rather than just Neil Armstrong, and Buzz Aldrin hasn’t yet died – but this isn’t real life, it’s a cartoon (There are no pearly gates in real life either). 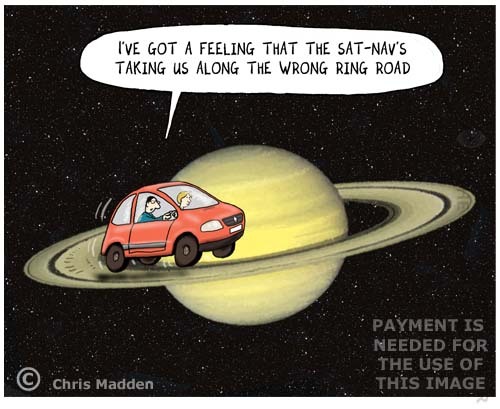 I’m very pleased to say that one of the first requests to use this cartoon came from NASA. You can see it here. 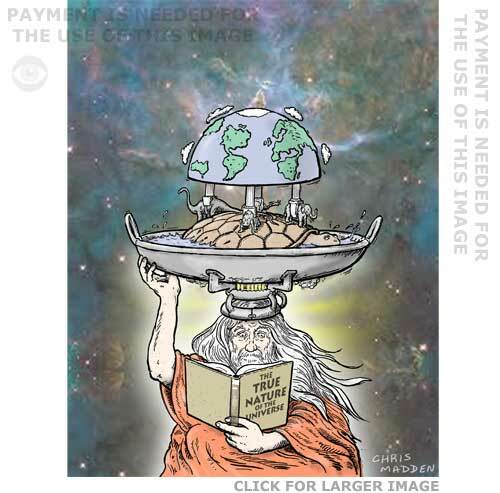 The cartoon or illustration is intended as a logo or design to promote science education. 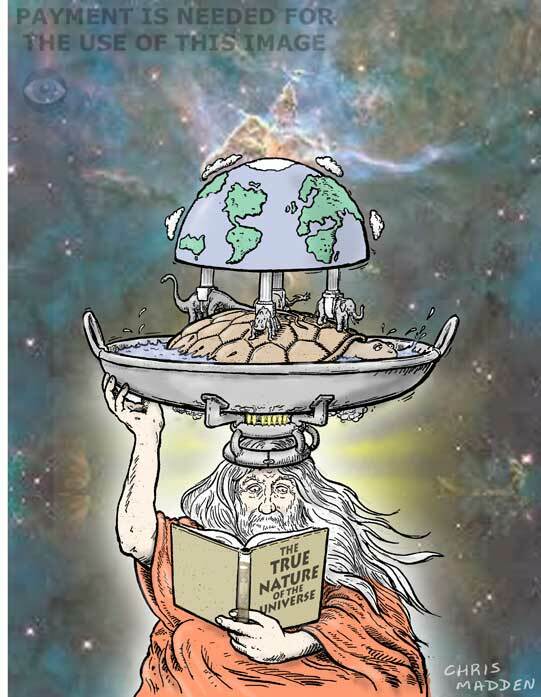 Part of the joke in the cartoon is that the god figure is reading a book that explains the origins of the universe. The cartoon is an updated version of an illustration that I produced in the 1980s for the Guardian newspaper. Cartoon. A cameraman filming the moon for Stargazing Live and a cameraman filming an owl for Springwatch. Cartoon. The popular science tv programme Stargazing Live and the popular nature programme Springwatch have similar formats – a mixture of banter, audience participation and interesting information. In this cartoon both programmes are being filmed simultaneously to highlight their similarity. Stargazing Live is filming the moon, while Springwatch is filming an owl. Stargazing Live owes some of its popularity to one of its presenters, professor Brian Cox. An illustration of the idea that we are made of stardust. This is a nice idea, but the problem is that it’s more mundane than it sounds, as everything is made of stardust, including unpleasant things. It’s a phrase that is given spiritual and pseudo-spiritual layers of meaning, but it is in fact just a statement of fact about the general nature, construction and evolution of the universe. 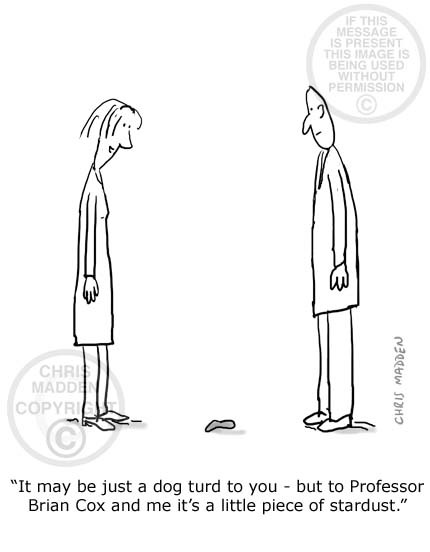 Philosophy cartoon. Which is more interesting – the night sky or a night on television? Is outer space boring or awe inspiring? The representative from the church (the Pope?) is thinking of hitting Galileo on the head with his telescope in order to shut him up. 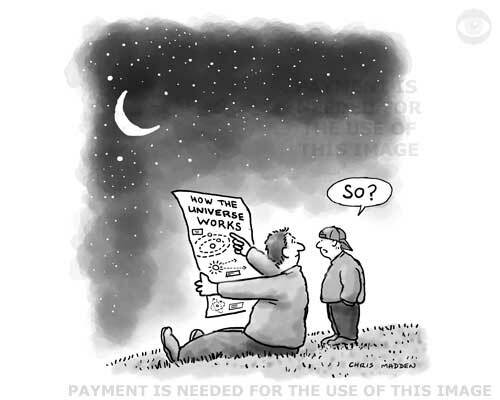 Cartoon of cavemen debating the nature of the universe. Moon mission or space exploration joke. A twist on the cartoon cliche of the desert island joke. Cartoon showing a boy who has no sense of wonder or curiosity about the world, and who isn’t interested in learning anything about how the world works. 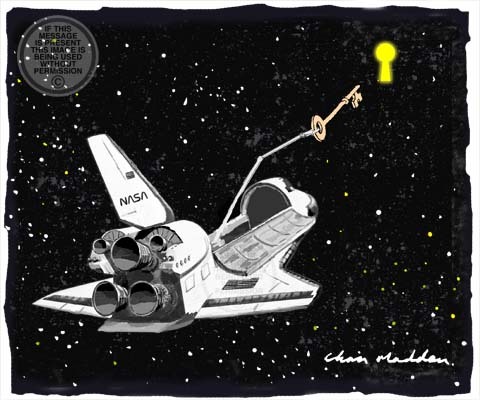 The space shuttle deploying scientific instruments (a key) to unlock the secrets of the cosmos. The keyhole in space is meant to evoke the shape of a cosmic phenomenon such as a galaxy, nebula (the Keyhole Nebula?) or perhaps the moon.